If you create content – a blog, video, a podcast, a Facebook page, a Twitter feed – any kind of online content, the new book Content Rules will give you insight and practical advice you can use to make your content even better, even more engaging for your audience. C.C. Chapman, co-author with Ann Handley of Content Rules, is arriving in Canada this morning to speak at Third Tuesday social media meetups across the country. He’ll be talking in Montreal, Toronto, Calgary, and Vancouver about how to make great content that builds and serves your community. make Content Rules the number one book on the Canadian business bestseller lists this week. 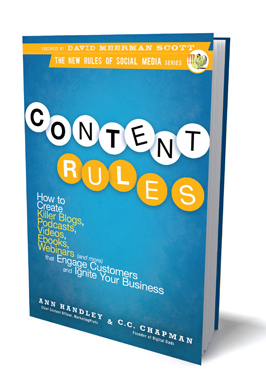 Between now and Friday, get a copy of Content Rules. If enough of us buy the book this week, I think we can push Content Rules to the top of the business best seller list. I bought my copy as an eBook from Kobo. Instant satisfaction! If you are a fan of traditional hard copy books, you can get Content Rules from Chapters. Leave a comment on this post telling us when and where you bought your copy of the book. Tweet that too. The hashtag for the book is #ContentRules. I’ll set up a feed for the hashtag #ContentRules and capture your tweets for C.C. and Ann to read (I’m sure they’ll want to thank you) and for a wrap up post following the week. With your help, we can make sure that Content Rules in Canada this week.